Michael Portnoy, Character Assassination, 2017. Performance view, Volksbühne am Rudolfplatz, Cologne, April 18, 2017. Photo: Roel Weenink. THERE’S NO SATIRE QUITE LIKE THE PRESENT, a fact that poses a funny challenge to contemporary comedy—or at least threatens it with redundancy. How to harness the power of a joke, when a joke has been made all-powerful? Enter the great Absurdist, performance artist Michael Portnoy. His latest piece is titled Character Assassination, and it is (in part) a comedy heralding the end of comedy—or at least pointing to the rafters from which it’s hanging itself. Written in collaboration with Dan Fox (art critic, coeditor of Frieze, and author of Pretentiousness: Why It Matters), this deft and dizzying show riffs on the form of the late-night satirical news program. 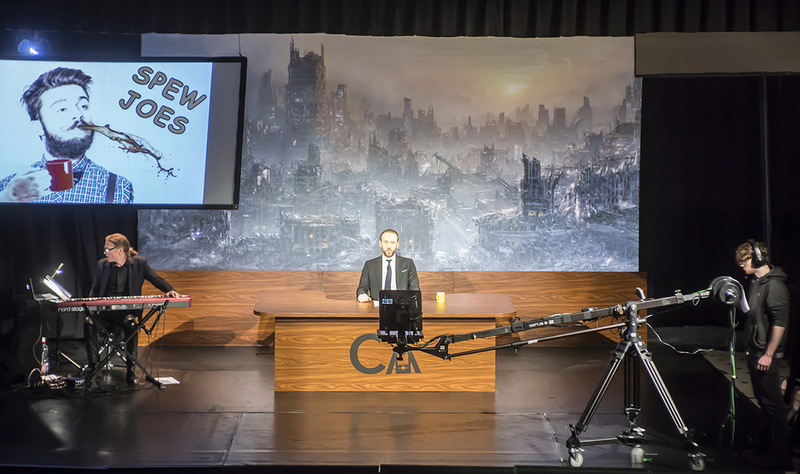 For a little over an hour, Portnoy delivers a monologue fueled by the bugaboolean logics that have long trumped popular political discourse, in “the only show about you and nobody else but YOU!” Sitting behind a large desk facing a teleprompter and camera, Portnoy is simultaneously projected onto a large screen on stage; you can watch him live, or “broadcast,” with video clips and graphics edited into the frame. Lest we believe he’s all about fun and games, Portnoy reads his news against a backdrop of a city in ruins. “Let me tell you,” he says near the top of the show, “trust has been left in the dust. If you’re gonna survive these days, you’ve gotta be one helluva paranoid android. Nobody is who they say they are.” With that, Portnoy plants the seeds for what might be called “The Conspiracy of the Self” and takes us on a ride through the rabbit holes of the information superhighway. He weaves a story that begins with a guy named Rigoberto and ends in an homage to Don Quixote, infamous battler of windmills. He sews doubts about the nature of theater itself. “How can you trust anyone in a place that’s built to provide a stage on which people pretend to be other people?” he shoots. “This building is a machine for lying!” Imagine: Even our fictions lie to us. Character Assassination is a play about language—our most elastic, plastic tool—and how it does the bidding of its user. Through the pens of Portnoy and Fox, mimicking the archness of comedy news, words perform all manner of acrobatics, pushing logic to take flying leaps into nothingness, without a net. Talk is cheap, but meaning is even cheaper: “I’m here to reveal to you tonight that we’re actually starved of context,” Portnoy explains to his audience. That context has been rationed by governments, hoarded by politicians, kept under lock and key by the church and state in favor of pushing a relentless junk-food diet of CONTENT. You can content-generate some of the people some of the time, but you can’t contextualize all of the people all of the time. What propels Character Assassination is of course character proliferation in larger culture: The overproduction of selves fertilized by our online feeds. Portnoy isn’t after people; he’s after their personae, mining what we think of as “proof” of who we are. Portnoy doesn’t disclose embarrassing truths about his victims, or if he does, we’re none the wiser, so super loopy are his fabrications. Character Assassination could risk more in this regard, charging the air with greater discomfort at who and what might be made public during the performance. Then again, that threat in the end felt like a dupe—a clever trick to reveal one of the most uncomfortable truths of all: That there is a banality to our so-called public personae, to how we imagine and present ourselves inside the given algorithms. It’s all theater, in effect, but not all of it’s entertaining. And I wonder if Portnoy and Fox’s extrapolated fictions—twirling, vertiginous, and very funny—mask the fact that most social networkers portray themselves in flattened, flattering ways, tastefully serving themselves up for the middling palates of public consumption. Was there any funny business to be found? Any radical acts of selfhood? Perhaps the real question is: What do we learn about each other when mediated online that we might not otherwise in person? After all, contenxt is everything. Character Assassination premiered on April 18th at the Volksbühne am Rudolfplatz in Cologne as part of Pluriversale VI, organized by the Akademie der Künste der Welt.